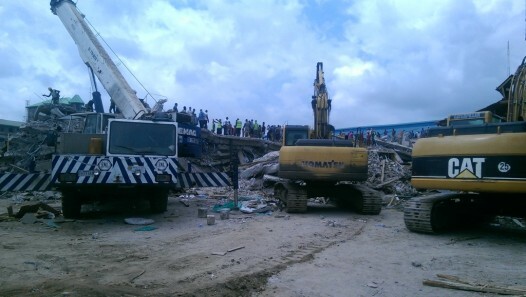 The number of dead South Africans at the collapsed five-storey guest house owned by the Synagogue Church of all Nations has increased from 67 to 84, the country’s High Commissioner to Nigeria, Lulu Mnguni, has said. Mr. Mnguni, who stated this in an interview with AFP, also revealed that 265 South Africans survived the incident while 17 other national of that country remain unaccounted for. Last Friday, the five-storey guest house inside the church’s premises caved in as three additional floors were being added to the original two-storey building. “The number has risen from 67 to 84, with more bodies discovered on Thursday, September 18th. The number of South Africans who were in the church might be higher, as we believe that some people organized the trip themselves without using travel agents,” he said. The National Emergency Management Agency, NEMA has put the death toll at 90 people and 131 rescued. Nigerian authorities are yet disclose the nationalities of the victims of the tragedy.